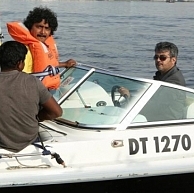 Cinematographer Om Prakash, the man who cranked the camera for movies like Naanayam, Vaagai Sooda Vaa and Neethaane En Ponvasantham has teamed up with director Vishnuvardhan for Arrambam. The cameraman spoke in a recent interview about how important it is to translate the vision of a director on the screen and how the usage of tones was important for films. Om recollected that he wanted to give Arrambam a green tint as the script demanded that and Vishnuvardhan was able to understand what he was trying to do. Om Prakash mentioned that it was important that the actors and technicians cooperate with new ideas and he was happy that the entire team of Arrambam that includes Ajith, Arya and Nayanthara acted as true professionals. Arrambam is due for release on the 31st of October. With so much talk about the movie already, and with the magic in the Vishnuvardhan-Ajith combination, the movie is no doubt going to be a Diwali Dhamaka. People looking for online information on Arrambam will find this news story useful.